As you probably already know the American National Standards Institute publishes a voluntary set of standards and best practices for the construction industry. The latest standard addresses equipment used to tether and/or contain hand tools, components and other objects that could fall from at-heights applications. Increasing numbers of employees are finding themselves ascending to heights to complete their work often directly over or adjacent to their colleagues, by-standers and other individuals at lower levels. Protective equipment, such as hard hats, have long been available to minimize the effects of struck-by incidents only after an object has fallen. Active controls utilized to prevent falling objects by tying them off or containing them while at heights are a rapidly growing practice. Dropped objects include hand tools, instrumentation, small parts, structural components and other items that have to be transferred and used at heights. ANSI/ISEA is offering further guidance on the design and testing of products with anchor and connection points (after original manufacturer). Specifically, containers and tool tethers with carabiner or snaphook-type connectors should have locking gates and captive eyes. Containers should also have a minimum of a closure system, integral anchor points or integral tethers. Ritz Safety works with suppliers like 3M and Ergodyne to promote these voluntary, consensus standards across their fall protection products. 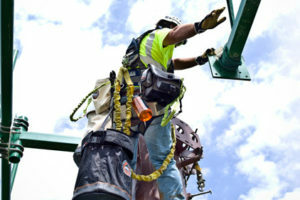 Do you know how to don a fall protection harness correctly? OK, you probably do, but do your workers know? Proper donning and fitting of your fall protection harness can mean the difference between a protected, controlled fall with a safe recovery, and a fall producing injuries, or even worse, death. Make sure your employees know their stuff with these 5 simple steps to don a fall protection harness. Hold harness by the back D-ring. Make certain straps are not twisted. Slip the harness over your arms and onto your shoulders. Make certain straps are not tangled and hang freely. Shoulder straps should be kept vertical, not pulled into the center of your body. Grab back leg strap and connect to the buckles attached to the straps on each hip. Pass excess strap through loop keepers. Leg straps should fit snugly. Attach the chest strap by passing male buckle through female buckle. Strap should be 6″ below top of shoulders. Pass excess strap through loop keeper. To tighten the harness, pull on the strap’s free ends. To loosen, push down on the adjuster buckle frame. Straps should be the same length. The back D-ring should be centered between your shoulder blades and slide up and down to position. Are you using the right fall protection? Find out with this simple formula! PFLs…SRLs…shock-absorbing lanyards. In the world of fall protection, it’s easy to get confused by all the available options. How do you know which fall protection product is right for your application? 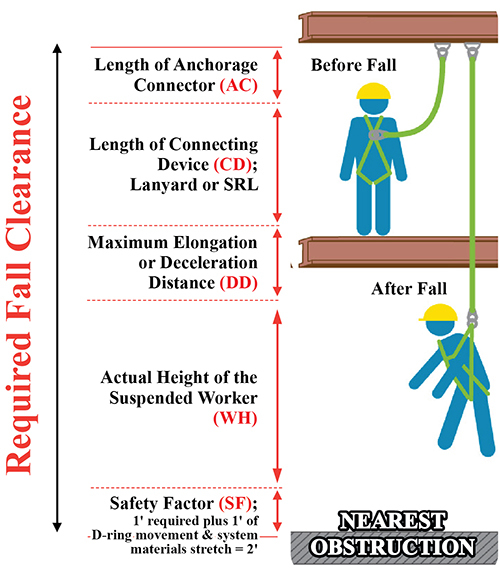 Thankfully, there’s a simple formula to calculate the required fall clearance for any work situation, and to determine just what type of fall protection solution is needed. Distances under 18 1/2′ require a self-retracting lifeline. Distances over 18 1/2′ require either a shock-absorbing lanyard or self-retracting lifeline. For distances under 14 1/2′, contact us to talk about specialized fall protection devices. Remember, having the right fall protection equipment can mean the difference between life and death for your workers!